Every modern organization depends on software, and where there is software there are metrics and logs and, one would hope, monitoring of these two critically important types of data. Operations teams have traditionally used two separate sets of tools – one set for monitoring metrics, another set for collecting logs. Sometimes the alerting component was separate, too, and often limited to alerting on metrics and logs. Anomaly detection is a relative newcomer to the scene. Is using multiple separate tools for firefighting production issues fun or efficient? Not at all! Switching between N apps and UIs or even just browser tabs when you are rushing to fix a production problem is the last thing you want to do! Sematext started as a professional services company, offering its Elasticsearch and Solr expertise to clients large and small, through consulting, production support, as well as training. As consultants we quickly saw the need to have deeper insights into how Elasticsearch and Solr performed. We needed metrics monitoring so we could find and fix bottlenecks, etc. So we built SPM and added a number of monitoring integrations. But think about what do DevOps often do when they get alerted about a production issue or when they see worrisome patterns on performance metrics charts? They often dig into logs. 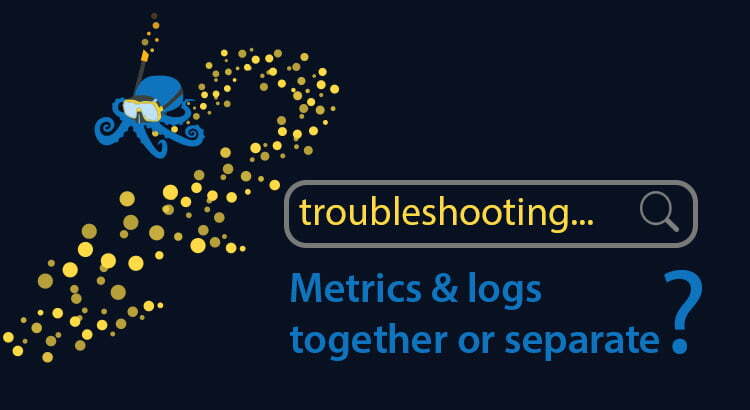 Logs and metrics’ are long lost cousins – they belong together! So we built Logsene. Logs and metrics’ are long lost cousins – they belong together! We’ve been preaching the Metrics+Logs Belong Together mantra for years now and the recently announced Sematext Cloud is the result of our work on bringing metrics, logs, alerts, anomalies, and other types of events together, under one roof. But we also thought it would be good to see how others feel about this. We recently conducted polls on Twitter and Facebook asking DevOps to tell us if they prefer Performance Monitoring and Log Management as two disconnected silos or if they prefer an all in one solution. Poll for #DevOps who love their Monitoring & Logs — quickly, pick your preferred setup for Monitoring and Logging tools! Close to 1,300 people voted via Twitter. As we can see, most people – close to 30% – would prefer metrics+logs together. Almost a quarter of participants say they’d still prefer silos, which is surprisingly high. One possible reason for this is that, due to monitoring and logging tools historically being separate most people simply don’t have the experience with solutions that handle metrics and logs together, so there might be a natural tendency to vote for a familiar, existing, works-for-me setup. To avoid any potential bias Twitter users may have we conducted the same poll on Facebook, where the gap between silos fans and all-in-one fans was noticeably bigger — almost 60% of participants prefer all-in-one metrics+logs solution to using separate metrics and logs tools. What about you? If you’re tired of context-switching between your monitoring and logging tools and you get the value of having metrics, logs, alerts, and events all together, side by side, and correlatable, sign up for Sematext Cloud. It’s free and takes only a few minutes to configure an agent or log shipping. If you can’t ship your data to the cloud, email us about Sematext Enterprise — the exact same functionality, but packaged to run on your servers, VMs, containers, or private cloud. Eval copies are available and we’d be happy to give you a demo!